This is a step by step photographic guide to things you need to know. There are some things that the newer rider (like me) will not need to know right yet (clipping and training ground manners but the things we need to know (haltering, grooming and other basic things) are covered with great pictures that show every step. This book is great because in addition to the words there are pictures that make everything crystal clear. This book matches exactly what the title says it is providing the beginner with the basics of handling and grooming on a horse that is use to both (in my mind set it pertains to a very gentle well trained horse that is use to a lot of handling, like someone else stated a sound horse). The pictures and text appear to be complete on how to do things right and it's my kind of book, no long winded, wasted or unneeded words to make a bigger book thus wasting my time or book shelf space. It does just cover the basics on how to do it (not with a horse that is unruly) and on handling you will quickly out-grow the book. It does contain more information on grooming than it does handling so if you are new at that it should be very helpful. This book really is for beginners but a great book to have. I am 15 years old and it taught me a lot about horse handling. My favorite part of the book was about what kind of tack to use. It gave basic knowledge about horses which was very useful. I'm 11 years old and found this book very helpful! It teaches you bathing,grooming and proper horse handling.I would recommend this book to novice and experienced! This book is good for beginners, intermediates, and advanced alike. With Hill's pictures and precise information, this deserves a two-thumbs up. For beginners, Hill explains the basics of handling horses, grooming them, and washing them. For the intermediate and advanced riders, all of this reminds them about the basic horse care. A must for every rider and horse owner! As a new owner of young untrained horses this book was invaluable in my library. The step-by-step photos make every skill easy to understand and attempt with your own horse. 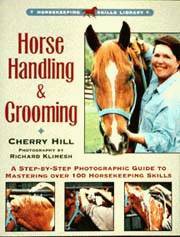 The instruction text is clear and concise and Cherry Hill has covered the "must knows" for every horse owner. I would recommend this book for any horse person.